According to the United States Energy Information Administration, renewable energy generation now surpasses nuclear energy production across the country. This is good news for the renewable energy sector which has been receiving increased attention over the past few years, yet little observable progress in surpassing conventional energy production. A look at the beginning of 2011 reveals that biomass/biofuel, wind, geothermal, hydropower, and solar power constituted 11.73% of energy production in the country or 2.245 quadrillion Btus of energy. Nuclear power production totalled 2.125 quadrillion Btus over the same timeframe. A closer inspection of renewable energy shows that biomass/biofuel is in the lead with 48% of all renewable energy production. This is followed by hydropower at 35.41%, wind at 12.87%, geothermal at 2.45%, and solar at 1.16%. However, these numbers only reveal a small snapshot of time, and don’t reveal the huge inroads made by wind and solar energy production recently. In particular, solar production has remarkably increased by 104.8% since early 2010, while wind has seen an increase of 40.3% over the same time period. Therefore, wind and solar may only represent a small share of all renewable energy now, but given a few years, they could very well take off and dominate the renewable sector. This projection is well grounded in expert analyses, which highlight the exponential increases in solar technology over the past number of decades. These technological increases have been coupled with decreasing costs for solar power generation on a near annual basis. A continuation of these trends will put solar on track to compete with coal by 2015. These bold numbers for the renewable energy sector are reassuring in the wake of the Fukushima nuclear disaster recently, which highlighted the drastic consequences that can arise from relying on nuclear power generation. Perhaps these numbers will pave the way for further renewable energy investment and pro-renewable government policies in the US. Do you think there is anything the government can (should) do to further encourage renewable energy around the country? Or should the market be left to its own devices? 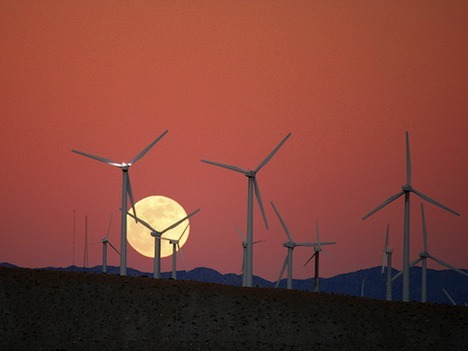 Image CC licensed by Chuck Coker: Moon Rise behind the San Gorgonio Pass Wind Farm, California.